Oui brunch. Yes, oui do. Golf Girl is staying with a friend who lives in Marina Del Rey, so we met them at Le Marmiton (4724 Admiralty Way, Marina Del Rey) this morning. 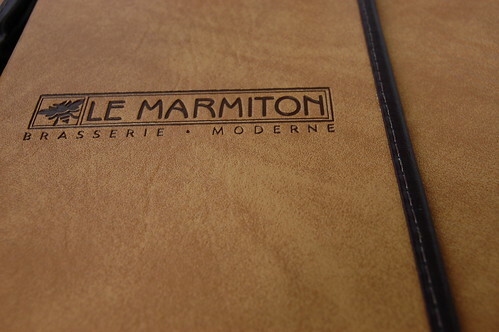 Le Marmiton is an unassuming eatery in a strip mall, but the patio area is lovely and sunny. If you have a good imagination, you can pretend you're at a French cafe. Our real French server, who was friendly and funny, helped make that easier. 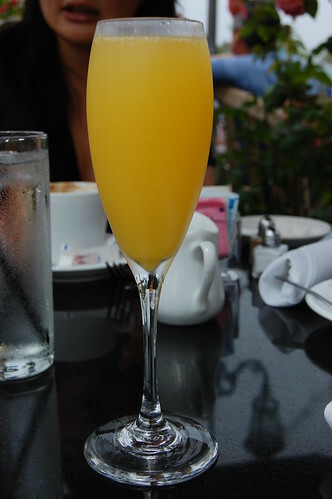 So did a mimosa ($10.00). 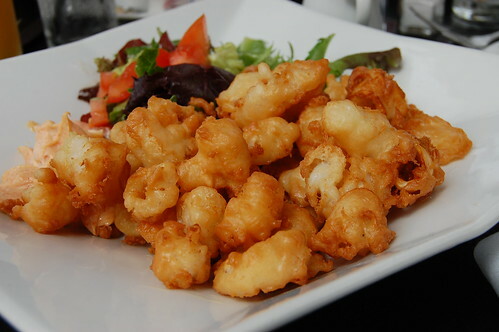 We started with some tempura calamari ($9.95). 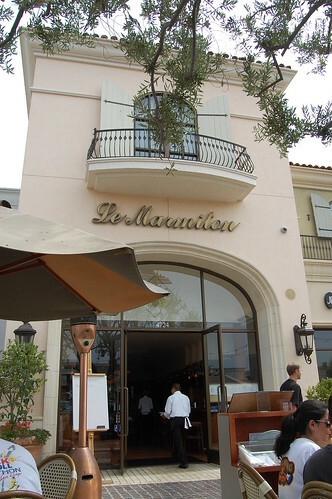 Gotta love Los Angeles, where a "French" brasserie serves you "Japanese-inspired" food. The batter was a tad on the thick side and was not like tempura at all. Not impressive. But it's fried finger food. You can't go too wrong with that. I spared Golf Girl and her friend from my meal snapshots. 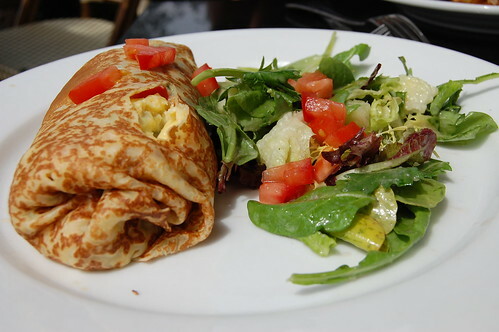 Mr. Monkey and I split two crepes -- La Californian and La Provençale, each $11.95. 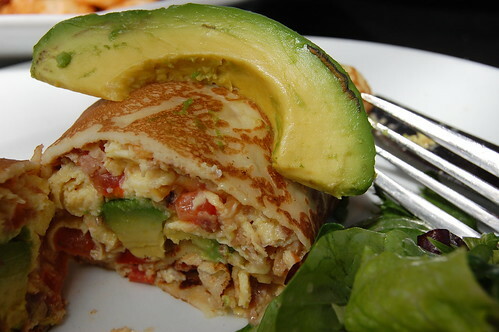 La Californian contained tomato, avocado, bacon, and scrambled eggs. 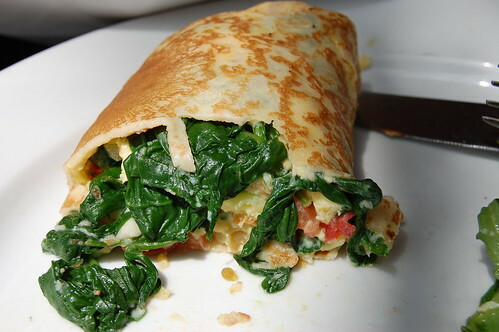 La Provençale housed spinach, zucchini, tomato, mozzarella cheese, and scrambled eggs. La Provençale suffered from extreme blandness, so we doused it with Tabasco. La Californian was bit more flavorful on account of its bacon. I wasn't wowed, but it was still good enough for this ending. $10 for a mimosa?! Holy cow. I guess the one drawback of you becoming such a wonderful photographer is that you make every meal look so beautiful and delicious. 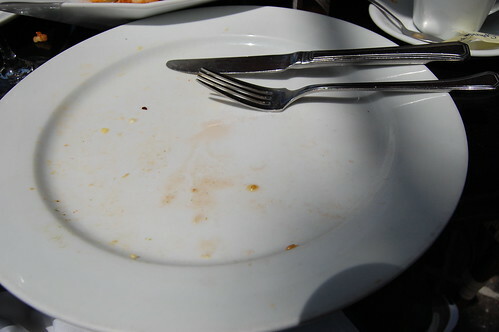 With pics like yours, I find it hard to believe that meal wasn't outstanding! 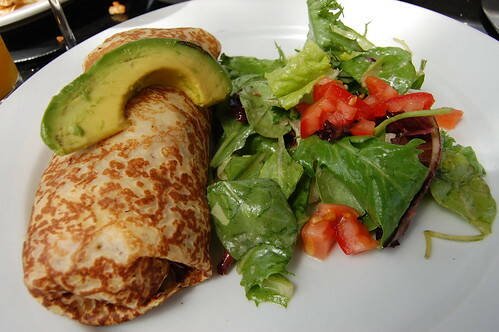 those crepes are so not the real thing. but I suppose they will do for being on the other side of the atlantic. Hmmm, that gigantic piece of avocado was enough to distract me. yet another example of "bacon makes everything better"! dang it. tam pham beat me to it. all crepes should include bacon in copious amounts. NFT. Looks like another tasty monkey adventure. Even if it wasn't all super tasty. the pics make it all look quite mouth-watering.